When presented with the opportunity to experience Illuminae in audiobook form, I was both ridiculously excited and nervous. Excited, because, hello, Illuminae! And nervous because I don't usually do audiobooks. I am too unfocused, too easily distracted and, in most cases, easily bored by the monotone narration. I was afraid I would end up hating the audiobook, or at the very least have a very lukewarm reaction to it. But, boy-oh-boy, the Illuminae audiobook is a work of art! Between the fabulous cast (Olivia Taylor Dudley, Lincoln Hoppe,Jonathan McClain), and all the superb sound effects, transitions, etc - it's an audiobook like no other out there. I was thoroughly impressed with the quality of it. I wouldn't say it's better than the book itself, because if you've seen the physical copy with all of its glorious formatting, you know just as well as I do that it's a reading experienced that can not be matched. BUT, the audiobook takes that phenomenal experience to a whole new level of mind blowing. Moreover, while reading the book, I actually had a bit of a hard time connecting with Kady and Ezra, at least at fist. I did not feel the same way while listening to the audiobook. I got immediately sucked in and could hardly force myself to hit pause on my CD player. 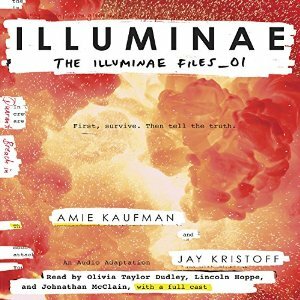 I don't have a whole lot of experience with audiobooks, so far I've only listened to a handful of them, but dang, Illuminae is forever going to be THE audiobook for me. Ever since I've listened to it, I have been feeling more comfortable with the adudio form of books, and I've been picking up different audiobooks on regular basis (I've listened to YOU by Kepnes, A Different Shade of Magic by V.E. Schwab and the new collection of Stephen King short stories. And I loved them all, but not as much as Illuminae). Illuminae is just so incredibly powerful and entertaining to listen to. All the different accounts included in the book, all the notes and reports and chat logs, are even more gut wrenching when you listen to them on the audio. Plus, the audio form is so incredibly interactive and captivating. Both Olivia and Lincoln did a phenomenal job breathing life into Kady and Ezra - I thought they were perfect for the roles! They sounded professional and experienced, but also very teenage-like and believable. There was never a boring moment that would make my mind drift, I stayed focused and immersed in the story all the way through. I absolutely loved AIDAN's voice, too, though I'll admit that when I was reading the book, I imagined him to sound more like Jim Parsons (please don't ask why). Yes, the Illuminae audiobook really is THAT good. And the best part is, even if you're not into audiobooks in general, you will probably love this one. I can hardly wait for the next book and its audio version!! !